Agus M. Markham, pictured at right, at the presentation of his latest biography. In Indonesia, the government fails to recognize writing as a profession and publishing as a creative industry, thwarting its further development. In little more than a month, a number of writers and literary activists will leave from Indonesia to travel to the Frankfurt Book Fair (FBF). This year, we are the Guest of Honor. 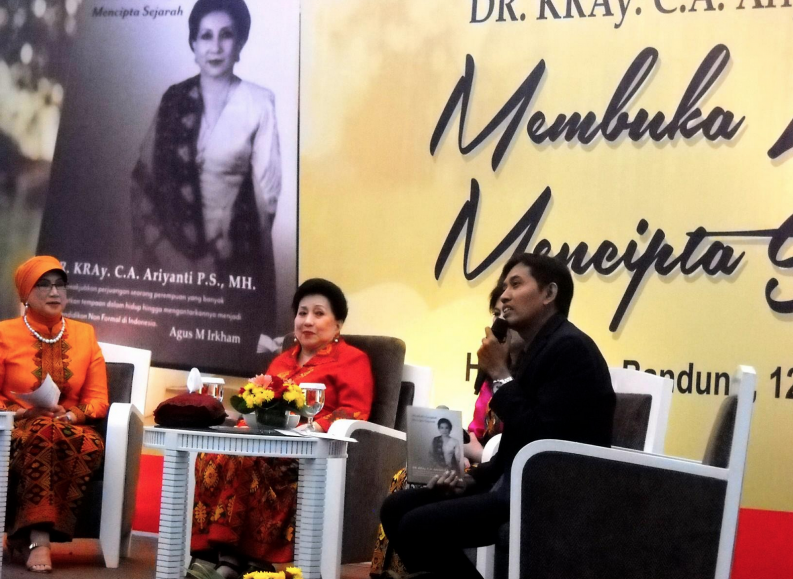 As Goenawan Mohammed (GM), the the Chairman of the Indonesian Guest of Honor Committee, noted, the majority of people chosen to attend the world’s largest book fair are the authors who have published books. “The authors follow the books,” he added. Indonesia’s turn as Guest of Honor is expected to be a milestone in the resurrection of Indonesian publishing. It should also be a milestone for authors and for the profession of writing in Indonesia. If it cannot be called as the milestone, at least it will hopefully be a trigger for the government to continue improving the book publishing ecosystem in Indonesia, and particularly, as it concerns authors. The list of authors from Indonesia attending Frankfurt represents not only a wealth of knowledge, but also the embodiment of a discourse — through their books — which is emerging in Indonesia. They are also practitioners of the new “content business,” whose life offers prosperity and profits, provided the system works. At glance, this may seem trivial, but it is ultimately about whether or not writing and authorship is viewed as a credible and legitimate profession. Without said legitimacy, how can one reasonably expect the government to regulate the publishing industry, or even go so far as to offer development a strategy or overall books policy? To wit: in 2006, the government began drafting a Law of the National System of Books, but it was never passed. What’s more, the country also saw the dissolution of the National Book Council. Furthermore, in early August, when President Jokowi met with creative industries practitioners at the opening of Indonesia Convention Exhibition, he announced that the “creative industries” will be a pillar of the Indonesian economy. In support of this, the Ministry of Finance offered VAT exemptions to some sub-sectors of creative industries. It’s a wide-ranging list, that covers everything from from movies and performance art, to beauty pageants and fashion shows. How about a break for book publishing? No. There remains no exemption or reduction on the tax amount collected, either relating to the raw materials, especially paper, nor to distribution and bookselling. The book industry is still subject to VAT tax of 10%, plus 1% of total gross revenue. What about a tax break for authors? No. It’s absolutely the same. Authors still have to pay a 15% tax on royalties earned (which comes through a calculation based on the book sales price). What’s more, if they do not have the Taxpayer Registration Number (TRN), they are hit with a 30% tax! All this while the country itself is seeing an annual GDP growth of 6% per year! Introducing Indonesian writers, books and intellectuals abroad through the Frankfurt Book Fair is important. However, I fear that if it won’t provide a significant and positive impact for the development of the book industry ecosystem and the lives of the Indonesian’s authors at home, it will have failed in its mission. As was once said by the prominent Indonesian writer Putu Wijaya: “Penulis tetap selalu dikejar-kejar harimau dari luar (kebutuhan materi” (authors who are always chased by the tiger from the outside [material needs] will no longer be able to work clearly and independently). Agus M. Irkham is a biographer, literacy activist, and book consultant. He serves as the Head of the Department of Research and Development at the Central Board of Indonesia’ s Social Reading Room Forum. Note: This article, which originally appeared on the author’s blog, has been edited for clarity.